Landgraf Online Memorabilia & Furniture Auction — Harritt Group, Inc.
Cash or check. Credit Card w/3% convenience fee. Selling online the remaining collection of the Kenny Landgraf Estate. Kenny loved motorcycles and was a collector of local memorabilia. 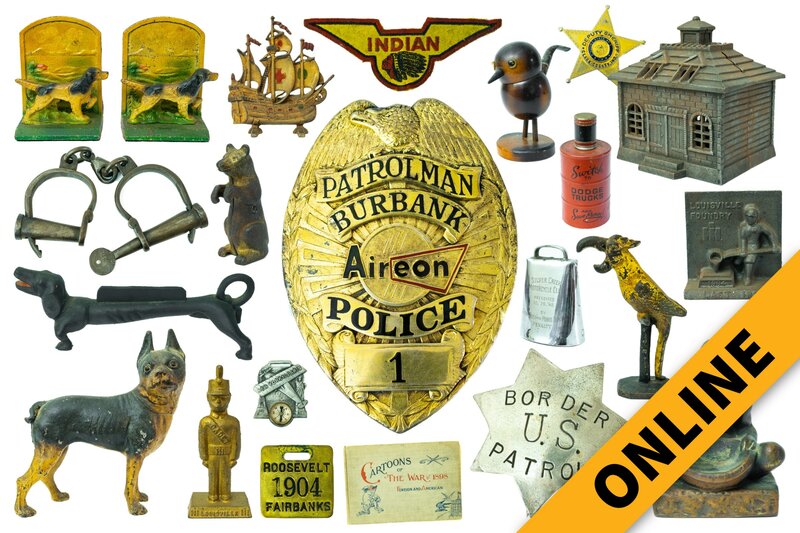 Enjoy bidding on these 140 select items from his collection including badges, motorcycle and local memorabilia, vintage toys, advertisement, framed art, antiques & furniture. Auction located just 3 miles NE of I-265 Charlestown Road Exit. Large 5’ wide antique walnut bow front china cabinet in original finish, 5 stack Globe Wernicke stackable barrister bookcase #709, antique oak bookcase w/ carvings, round oak pedestal dining table from B.L.Curry Veneers, (2) ornate French style caned twin beds with curved head & footboards with matching vanity w/stool, gentleman’s chest & nightstand by John Widdicomb Co, art deco walnut china cabinet w/carving & claw and ball feet, organ stool with claw & ball feet, marble top Victorian lamp table, vintage cast iron NAHS auditorium folding seat, (4) 1930’s dining chairs, (5) retro wood office chairs & (1) rolling desk chair, clothes tree, 1930’s caned arm chair and rocker, leather top mahogany Duncan Phyfe coffee table made by Weiman Tables, mahogany Duncan Phyfe dining table, handmade pine corner china cabinet and vintage stainless anasetic sterilizer cabinet. Coin silver Texas Ranger & US Border Patrol badges, Entenmann Sterling Burbank Police Patrolman badge, Burbank Police Sergeant badge, coin silver US Deputy Marshal badge, Carl J. Atkins Sheriff & NAPD badges and photos, (3) Clark County, IN Deputy Sheriff and Police badges, National Bank of Kentucky Detective badge, Deputy Sheriff, Industrial Service Patrol badge, Private Detective & Boswell IND Fire Chief badge, New Albany Indiana Patrolman badge, Huntsville Alabama Police badge, Scipio, IN Volunteer Fire Dept. Badge, Harris County Texas Deputy Sheriff badge, Mengel Co. Fire Brigade Chief badge, Private Police Louisville Ky., Merchant Police Louisville KY & Highview KY Fire Dept. badge, Deputy Sheriff Floyd County IN wallet badge, Special Deputy Crawford County Sheriff badge, Boston Special Police badge, Pekin IN Fire Dept. hat badge and Jefferson County Special Sheriff badge. Bronze Native American Chief sculpture by Lincoln Fox, cast Bull Terrier & German Shepherd door stops, cast toucan bottle opener, 1974 IH Cadet Louisville KY, IH Louisville Foundry Last Iron bookend, IH Louisville Works anvil paperweight, cast iron tall ship table lamp, Lincoln In The Chair cast bookends, pair of cast iron bird dog bookends, cast iron building still bank, 2 sets of 1800’s hand forged shackles manacles, miniature Louisville Slugger autographed bat display, 1904 National Cigar Stand match safe, vintage Justin Belt Company Fort Worth Texas bronco belt buckle, 1936 Texaco license plate topper advertising Bloomer Dodge Plymouth, pair of brass spurs, ice cream mold from Emery’s New Albany, IN, cast iron bear still bank, cast Native American brave still bank, Occupied Japan vintage Santa, Louisville Stoneware Wes Unseld University of Louisville plaque, 1945 Philippine Islands 38th Inf. Div. plaque, Cartoons of the War of 1898 book, Emerson art deco radio, Ram hood ornament, vintage Dodge Brothers memorabilia, Occupied Japan pipe stand, cast Native American Squaw pipe rest, 5 Mark Twain books, (2) JFK busts, cast iron dachshund boot scraper, vintage Sky Chief Texaco Midwest topper sign, vintage cockatiel lamp, Central Oil Gas Stove Co. Daisy No. 2 cast iron food warmer Pat. 1893, blue & white European wall mount coffee grinder, CCC pennant, 46-star American flag, National Guard Armory embossed sign, Mail Pouch tobacco thermometer, vintage guitar Model CL110, 1993 U of L Liberty Bowl Champion street sign, WPA brush hook, Deering & Western Roller implement seats and army blanket with collection of military patches. Silver Creek Motorcycle Club silk shirt, Silver Creek Motorcycle Club 1948 poker run bell, vintage 1950’s AMA Gypsy Tour badges, 1900’s AMA watch fob, selection of AMA Year pins, Indian Motorcycle patches, early Indian Motorcycle lapel pin, 1940’s The Enthusiast magazines, 2 Harley Davidson 50 Year pins, vintage hand decorated motorcycle helmet, 1930 framed Harley Davidson magazine ad and (9) 1950-60’s Indiana motorcycle license plates. Vintage 14K gold FOE watch fob w/eagle claw and jeweled eagle, (2) 14K gold wedding bands, 1970 University of Maryland ladies 10K class ring, sterling silver First Step On The Moon coin, (2) sterling silver shot glasses, small sterling silver stamp case w/eagle, sterling Hey Diddle Diddle spoon, silver sugar spoon and vintage sterling pea pod shoe button hook. Early Pepsi Cola Co. eagle key fob marked New Bern, NC, early 5 cent Coca Cola key fob, Hamlight Cold Blast Lantern Rochester N.Y. key fob, American Car & Foundry Co. Boxcar key fob, 4H FFA Louisville Fat Cattle Show 1946 key fob, 1909 Louisville Industrial Exposition key fob, 1934 Louisville 35th VFW Encampment key fob, New York to Paris & Eagle key fobs, (2) Gohmann Bros. & Kahler Co. New Albany, IND Pointer Ranges key fobs, (2) 1867-1917 50th Anniversary Depauw Lodge Masonice New Albany, IND key fobs, early Masonic Chicago key fob, 1853-1929 Concord School House Masonic key fob, Rub No More elephant advertisement key fob, Monon R.R. YMCA Lafayette, IND key fob, Indiana World War Memorial key fob, Seal of the State of Indiana key fob, 1904 Roosevelt Fairbanks political key fob, 1922 K of C Supreme Convention key fob, Buffalo Bill Statue Cody, Wyoming key fob, 1920 Republican National Conventional Chicago Lincoln key fob, Illinois Watch Company Abraham Lincoln medallion, City Ice & Cold Storage Jeffersonville, IN key fob, (11) bulldozer key fobs, 1933 American Legion Chicago 50th Conventional medal, 1961 50th Anniversary Indianapolis 500 lapel pin, 10K gold Boys Eagle Scout Mothers pendant, Boy Scout 25 year veteran pin and Cub Scout pin and vintage Pari-Mutuel Clerks’ Union of Kentucky pin. Casey Jr. Disneyland Express wind-up train, Gene Autry and Champ Button, Lone Ranger Round Up snow globe, Hopalong Cassidy button, sterling silver Roy Rogers saddle ring, Roy Rogers cup, harmonica, pennant & kerchief and Old West Stage Coast with box. C. P. Sanderson (New Albany, IN) Shipwreck & The Duel oil on canvas paintings, Cassius Clay (Muhammad Ali) vs Sonny Liston frame by frame fight poster, early Samuel Schiff New York Appeal To The Great Spirits framed print, 55th Annual Indianapolis 500 commemorative piece, Frederic March All This Week poster, turn of the century lithograph of children at play, WWI Navy Our Home Defenders poster, souvenir edition of The Indianapolis News of the 55th Indianapolis 500, yard long 1930’s couple and Cole Brothers Circus Ken Maynard poster. I-265 to Charlestown Road Exit #4. North 2 miles to right at light on County Line Road. 1 mile to auction at corner of Charlestown Road & Payne Koehler Road.